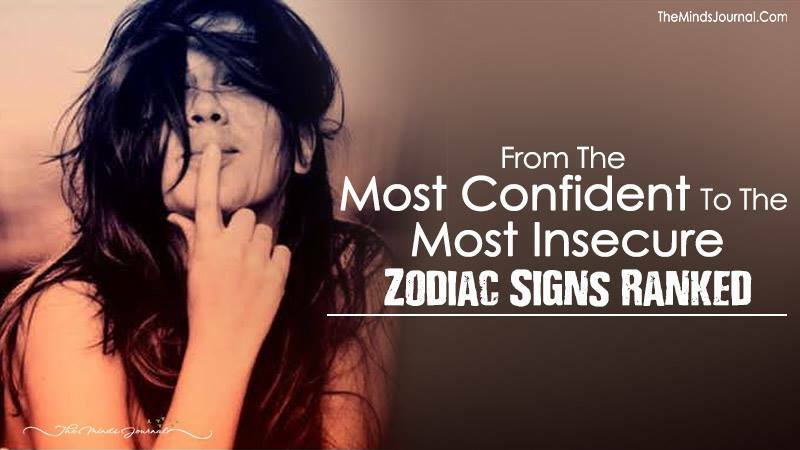 From The Most Confident To The Most Insecure: Zodiac Signs Ranked! You see this highly talented friend lacking confidence. You find it ridiculous that someone with such a talent would like that. The truth is, our confidence and insecurities are dependent on our zodiac signs. It’s our sun signs which are responsible for this. So, we made a list of zodiac signs ranking them in order of the most confident one to the most insecure one. The proud lion is the most confident of all the signs. They know what they want from life. They know what they do is the right thing. They would never settle down for anything less. If you underestimate them, they will simply ignore you and look for greener pastures. It can be anything, even while giving an examination. A Leo I know sat for his admission test in literature where he was asked the question, ‘Is literature related to politics?’ He wrote, ‘what a dumb question’ on the question paper and submitted it. He didn’t even care about the fact that he didn’t get admission. Such level of confidence! One of the extremely narcissist people you can ever have, a Scorpio is not bothered about anyone else. They have their flaws but they carry them with proud. It wouldn’t matter to them much if you don’t like them. What matters to them is that they love themselves. That’s how they deal with this world. If they are angry and burst out, they would have enough reasons to justify their anger. Capricorns dwell in flamboyance. They know they are good-looking and smart. But they live in seclusion too. They don’t get bothered much if you ignore them or if they are not accepted. They will keep on focusing on themselves. I have a Sagittarius friend whose favourite past time would be discussing about her haters. I remember we would spend nights cracking jokes on people who insulted us or mocked us. In one party, a snooty girl had called us, ‘hey fatso’ and my friend replied, ‘I feel so sorry for you. Are you homeless? Because you don’t seem to wear enough clothes or eat enough food.’ The look on that girl’s face was something I am going to remember all my life. Sagittarius hardly cares about who says what. They ignore and later on, deride those people. The fish has some confidence issues. If you meet a Pisces at a party, you are surely to get befriended by them. They are happy and optimistic when they are with others. They talk about their work, their personal lives and wouldn’t even mind telling people they are single or had a break-up. But deep down at the end of the day, when they are alone in their room, they suffer. They would stay up late night, introspecting and often feel insecure about things that are going on around them. Then, they next day when you meet them, they will be vibrant and cheerful as always. Sarcasm is they way of hiding their insecurities. Aries would never break down in front of anyone. When things get too tough, they will use sarcasm. They would not let themselves get exposed to the world as weak and they don’t care what others say about them. It’s important to focus on yourself. Sai you should be proud and confident! Hahahaha! Oh ikaduha kas pinaka insecure ahahahaha binuang mani babe nu?